Manchester City have announced their annual report for the 2016/17 season which includes some words from chairman, posted on the official website. “The 2016-17 season – the first under new manager Pep Guardiola – was something of a contradiction. It was a season in which no silverware was won by our first team and in which we finished third in the Premier League, only securing our Champions League position relatively late. And yet, at the same time, this was also a season of promise and of some very real highlights which will live in the memory for years to come. 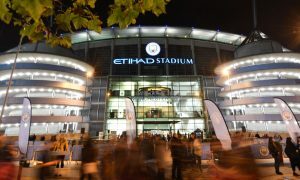 Whilst we achieved 12 more points in the League (78) than the previous season (66), silverware remains the most important on-field performance benchmark for His Highness Sheikh Mansour, myself and the Board, and in reality everyone involved with our Club. In the last seven seasons, we have won more trophies than any other team in the Premier League. In doing so, in the last five years we have scored more goals and have won more league games than any of our rivals. Having set such high standards for ourselves it is inevitable that finishing a campaign empty-handed brought with it a raw sense of disappointment. To some extent that disappointment was offset by the quality of football that was played at times during the season. The targeted investment in the summer of 2016 in some talented young players, blended together with the existing capabilities in our squad, led to an impressive start to the season and some memorable performances, such as Monaco at home and Manchester United away to pick just two. These displays gave us a hint of the type of football – and results – that we want to consistently see in the seasons ahead. For our women’s team, success came in abundance in 2016-17, including winning the domestic treble and making the semi-final of the Champions League. This was an outstanding achievement and coach Nick Cushing and the entire team and support staff deserve much credit for their hard work, professionalism and the extraordinary team spirit they have created. They have succeeded in firmly establishing our women’s team as a major force in the game. The high standards to which our senior men’s and women’s teams are held applies across all age groups, not least the Elite Development Squad. Two members of that squad made their first team debuts last season and nine trophies were won by our academy teams throughout the year. The ongoing development of Phil Foden and Brahim Diaz in particular, continues to be encouraging and our commitment to nurture our own talent remains a central pillar for the Club’s long-term sustainability. This was also a season where we said goodbye to some highly-regarded representatives of the club. Willy Caballero, Jesus Navas, Bacary Sagna and Gael Clichy all left with our thanks and recognition for their very real contributions to our continuing story, as did Samir Nasri and Aleksandar Kolarov after six and seven years respectively of significant service to Manchester City. And of course, in what was one of the most emotional nights ever seen at the Etihad Stadium, Pablo Zabaleta bade farewell to all of us after nine years of unwavering commitment to the team, to the fans and to the history of this club. A character such as his, both on and off the pitch, is something of a rarity and he will always be part of the City family. Away from the pitch, we have always been clear that on-field success and financial sustainability must exist hand-in-hand. For the third consecutive year, our business is profitable and revenues continue to grow to record levels for the ninth successive season, pushing beyond £400 million and towards the £500 million mark. We also continue to operate with zero financial debt. Beyond Manchester, our global footprint continued to expand with our community engagement programmes reaching ever further afield, with expanded digital outreach and new global partnerships. From City Football Group’s perspective, we welcomed our fifth club, CA Torque in Montevideo, Uruguay. This investment enables our organisation to build on existing connectivity in Uruguay and helps us to expand our options in identifying and developing local and South American talent. It also enables us to create an administrative hub for our pre-existing scouting operations in the region and provides us with our first permanent presence in South America. We are pleased to welcome the Club into the City Football family. It is important to acknowledge that this was also a year in which we were saddened by tragic events in the City of Manchester. In May of this year, Manchester experienced one of the darkest days in its recent history when the Manchester Arena was attacked. I know that many of our staff and fans were impacted either directly or indirectly by the incident. The emergency services in the city, with which we work so closely throughout the year when running matches, events and general operations, showed incredible bravery and resilience through this most testing of times and we remain grateful for their courageous service. The stories of incredible generosity and personal sacrifice in the most difficult circumstances showed the world the deep community spirit and strength of this special city that we are proud to be a part of. The 2017-18 season will be the tenth under His Highness Sheikh Mansour’s stewardship. In the context of more than 120 years of Club history, this is a relatively short period of time, but it has been one of significant growth, with much learned and much gained on a journey that still has a long way to go. We enter this season with a justifiable sense of ambition and expectation. A feeling shared by everyone who is passionate about Manchester City. For me that is the greatest indicator of the progress we have made since 2008.